I rocked out one of the most colorful dishes I have created in a long time. I was invited to a BBQ this past weekend and brought this dish to share. I live so close to the city’s largest Farmer’s Market and the season is bountiful with gorgeous produce. I was up early and filled with energy. I was excited to head over to the Farmer’s Market for ingredients to prepare my dish. The morning was crisp and temperatures were refreshingly mild. The walk was lovely. I plucked the prettiest veggies from my favorite farmers displays with a mission. I had my list and was prepared! In the end I switched up what I had intended for this dish because I was drawn in by the beauty of baby yellow tomatoes. Instead of using a marinade for this dish, I decided to use all fresh tomatoes. ‘Tis the season for them! Abundant tomatoes of all colors and varieties were enticing and beautiful. It is rare that I bring a dish to an event that has ingredients I cannot eat. However, this BBQ was different. I would be the only one with dietary restrictions and the hostess, who is also a gracious and considerate friend, had special foods just for me. Isn’t that so sweet? It was really fun to prepare this dish and I did pick through a bit and eat the vegetables I knew were safe for me. It was delicious!! It was a relaxed and enjoyable evening of interesting conversations that ranged from childhood memories of being in the kitchen with family cooking up favorite, traditional dishes to American culture and race relations. Fascinating topics went around the table! We ate, we laughed, we complained of the heat. We went between the shaded picnic area in the backyard to the air conditioned kitchen intermittently. It was a fun night and I am happy to say my dish received a lot of compliments so I think it was a success. One of my favorite phrases of the night was “when we talk, we keep it real”. As the conversations changed to more sensitive subjects, one person wanted to keep it going safely, so that was his “rule”. Say what we feel nicely, honestly and keep it real. I completely enjoyed that preface along with his occasional reminders that this is the best way to communicate with each other. People must keep it real. Seems that is becoming the theme in my life these days. I have to say, it is a refreshing and much more honest way to move through the world when you keep it real. I had a small container of leftover ratatouille that I took over to my bff’s house so she could enjoy the market fresh deliciousness. I knew I would not eat it and I certainly did not want this fantastic dish to go to waste. This dish was truly a farm to table kind of dish. I am deeply grateful to our local farmers for their hard work in growing this healthful food and bringing it to my neighborhood market for me to enjoy. Sowing and sharing harvest; now that is about as real as it gets. I got the pleasure of dog/house sitting recently. ‘Red dog’ is one of my favorite four-legged friends. What made this visit more exciting for me this time was that I had access to some good kitchen space and a large skillet. It made me so excited! I do have to say I love my new little studio and I am grateful every day for this sweet arrangement I have. But, I have not had the resources to make my tiny kitchen space more functional for me, which also means I am living with the bare essentials of my kitchen supplies. This has definitely been a lesson in how often I use certain kitchen items and I realize that I do use most of what I own regularly. I have been missing some of my most used supplies quite often! We will be back together soon enough! For now, I am doing the best I can until I can get a kitchen island and my favorite supplies from storage. I make it work because it is what I have now. But, for me, there is nothing better than a spacious kitchen with all the good gadgets and kitchen tools I need to create something fantastic. The home owners always offer up any fresh produce and foods in house, and sometimes I will eat something that looks like it won’t last, but mostly I have always planned my own foods to bring. I am living with slim financial resources these days and I just couldn’t plan my foods in the way I have in the past. 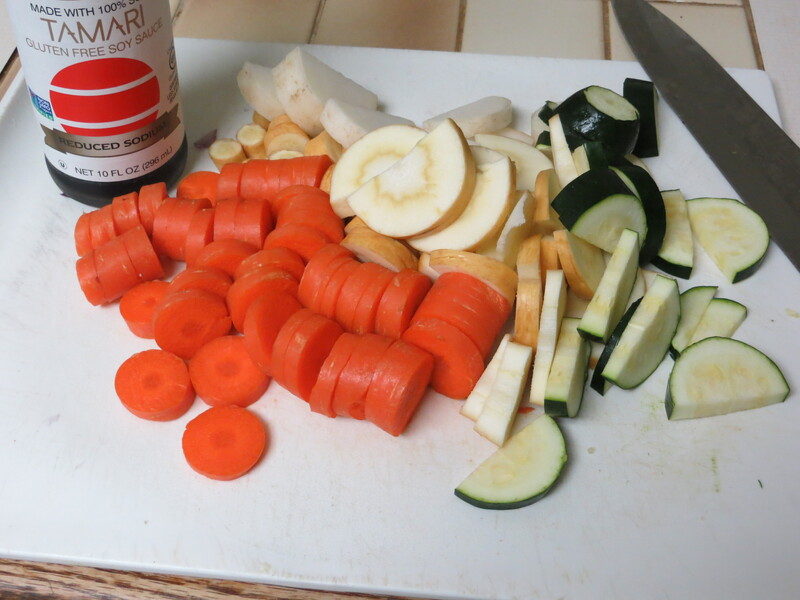 This time I welcomed the offer and used some of the veggies to create a delicious stir-fry. I brought my own brown basmati rice and made some of that, too. I love a big pile of perfectly stir fried veggies over a bed of rice. I have been craving vegetables! Variety! I regularly keep greens of some kind and carrots, but I just don’t have the space I used to for fridge storage so storing multiple types of produce just doesn’t happen. I keep it to my daily favorites. Not only did I get to enjoy one of my daily favorites in this dish, I enjoyed parsnips, red onion, zucchini and turnips. Someone recently said it would be good for me to eat some grounding root vegetables to help me feel more settled and secure. I think this dish accomplishes that. As well, these vegetables provide a winning combination of vitamins, nutrients and trace minerals. My stress levels will remain low and my spirits high. Can’t ask for better in a tasty meal. Give this a try. Let yourself feel good! Enjoy! 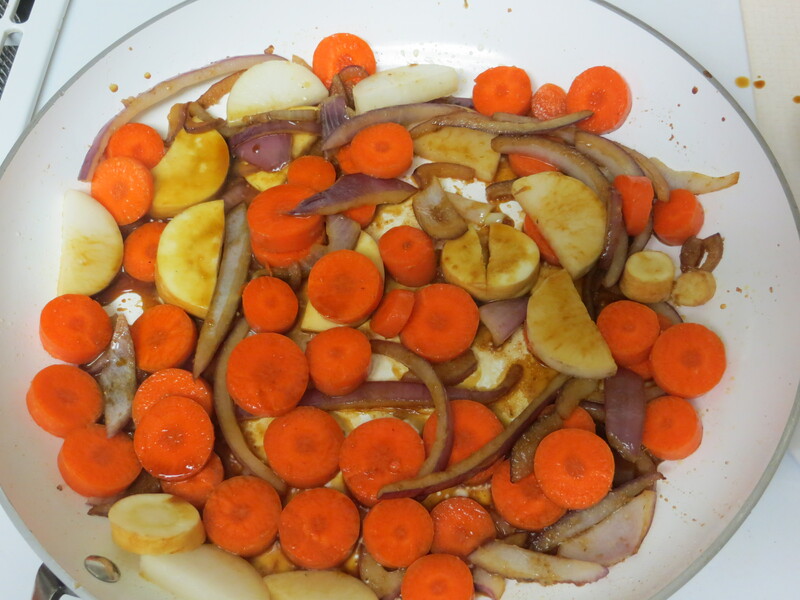 In a large skillet preheated on the stove top, add 1-1 1/2 Tbsp olive oil, dark sesame oil or combination of both. 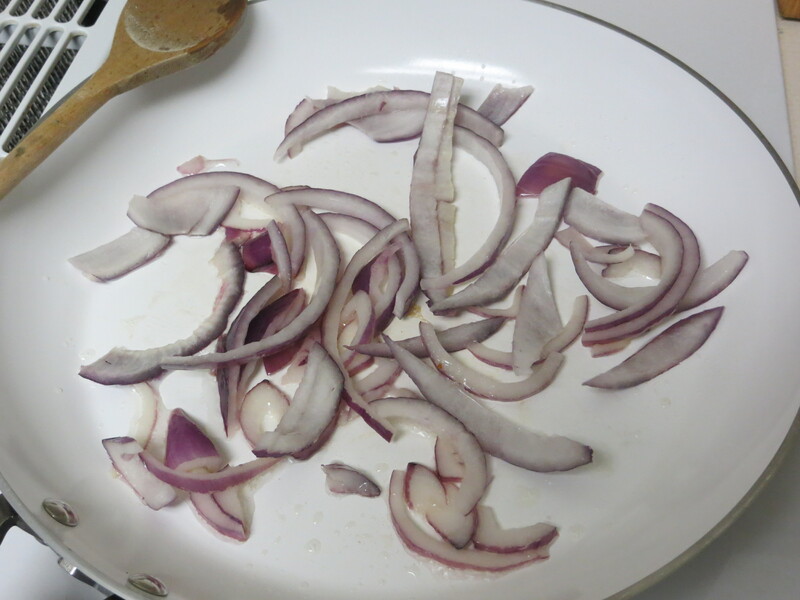 Add onions to pan and cook until translucent. Add roughly chopped, bite sized veggies of your choice, beginning with hardest veggies first. Add remaining veggies as the harder ones begin to cook. I added a few splashes of Tamari, a dime sized drop of oyster sauce and a generous sprinkling of thyme. Veggies stir-fried to al dente style is the most tasty! I was honored to be chosen as a guest blogger by Rogene who writes a blog called Espirational. Check out the post I wrote for her blog! While your at it, give her site a look as well. She provides some positive and inspirational reads that are sure to lift your spirits. I am grateful and incredibly appreciative for the acknowledgement. I love the support and encouragement I receive from my fellow bloggers! Thanks! 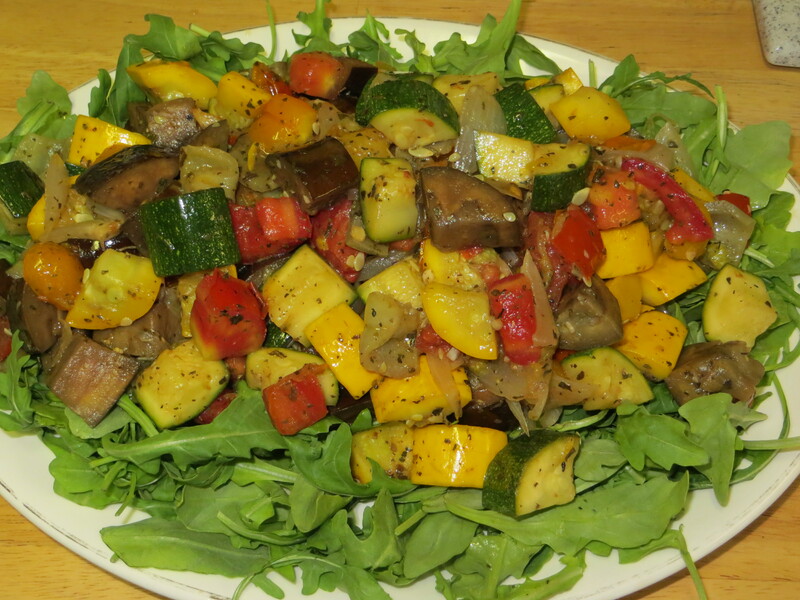 Our August Follower of the Month is Cathy Mounts of Foodradical.wordpress.com with a wonderful healthy cooking idea. There is something about being out in the woods that brings me a sense of peace. I can relax, I can be wondrous and thoughtful. I can find healing and gratitude. I can come back to the city feeling refreshed and renewed. 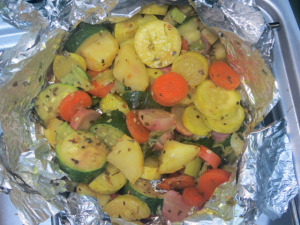 I have found tin foil pouches to be my number one favorite way to create delicious campfire meals, just the way I like them! That smoky, campy taste is undeniably delightful.